Rhythm Kids is a new drumming, music, and movement, program for children. Classes support children’s rhythm development and lay the foundation for formal music lessons. 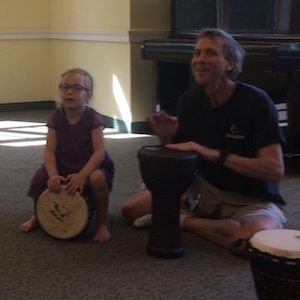 Children play dynamic musical games, participate in djembe drumming, and experiment with conducting and improvisation using a music repertoire that will engage and inspire school-aged students. ​It's a physically active, non-competitive class where every child contributes. 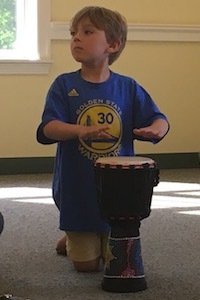 Children will be learning to play real drumming patterns from many places in the world, but simplified and made accessible by first learning them through spoken rhymes with animal themes. It is a very creative program and we are proud to be offering Rhythm Kids classes for our Music Together® graduates—and hopefully many new families looking for a nurturing, fun environment where their child can make music and develop new skills. Parent attendance is welcome but not required for this program. Each student receives a Rhythm Kids songbook, CD, and access to interactive online video drumming tutorials, so that the entire family can continue the fun and learning at home, and parents can stay connected to what their child is learning in class. Even if it has been a long time since your child has done Music Together, he or she still has the strong foundation of music competence that we will build on in this class. Feel free to call us at 781-859-8327 to discuss whether this class or the Music Together mixed age class is the right fit for your child. We'd love to have you with us!